When teeth shift out of place, more than just dental appearance is affected. Adults with moderate occlusion issues may find smiling confidently, speaking clearly, and maintaining good hygiene to be challenging, especially when their problems are left untreated. To help his patients overcome these concerns, David De La Garza Jr., DDS provides Invisalign® clear aligners as a discreet method of enhancing oral health and cosmetic appeal. Our practice offers treatment with Invisalign for patients in San Antonio and the surrounding communities. While everyone benefits from a straight smile, an unfortunate fact is that many adults avoid seeing their dentist for alignment issues. This is largely due to the belief that all orthodontic options are uncomfortable and cumbersome. Dr. De La Garza, an Invisalign Preferred Provider, offers nearly invisible, custom-fit aligner trays as an alternative to conventional braces. In cases where minimal to moderate adjustment is needed for these issues, our patients have seen great results from treatment with clear aligners. 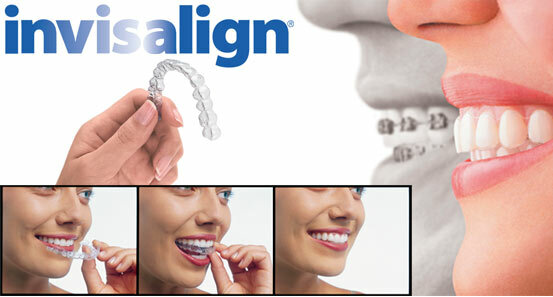 Invisalign patients benefit from a transparent solution where the only thing others notice is an improved bite and cosmetic appearance. Our dentist in San Antonio spends time at your consultation to explain the process, take photos and full impressions of your teeth, and capture detailed images using our panoramic x-ray machine. Our dentist sends this diagnostic information to representatives at Align Technology to develop a potential care plan. Depending on the findings, treatment can include clear aligners for 15 to 18 months or a more extensive orthodontic option. For complex cases, Dr. De La Garza collaborates with a local, trusted orthodontist as part of a comprehensive dental health strategy. At our San Antonio practice, we make sure you are seen by the right professional and receive the specialized services you need. Invisalign is a system of removable trays, making it easy to enjoy mealtime and keep proper hygiene habits like brushing and flossing. While this makes treatment convenient, compliance is also key when it comes to gaining meaningful results. Our dentist recommends wearing your clear aligners as often as possible, at least 21 hours each day. At your follow-up visits, Dr. De La Garza will check on your progress and adjust your Invisalign trays to ensure they fit your improving dental alignment comfortably. Unhappy with Your Smile? Call Us Today! If you have been avoiding treatment to correct the alignment of your teeth, it may be time to consider what Invisalign® clear aligners can do for you. Dr. De La Garza provides this efficient solution to help patients achieve an attractive smile and the confidence that comes along with it. Contact our San Antonio office today for more information and to discover if you are an appropriate candidate.